I do need your help. I'm actually designing my personal blog's theme and I got stuck when I could not code a working comment-reply-button with span element. 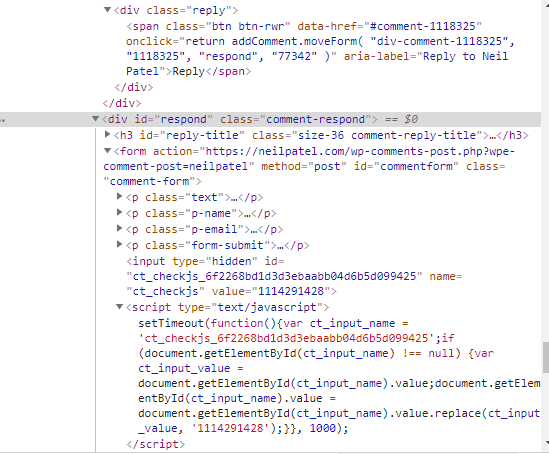 I know you must be wondering why with a span element when a person can easily use simple php command to get comment_reply_link in WordPress. Let me clear it, I am quite obsessed with perfectionism. Well, I am taking neilpatel.com's blog template as my inspiration theme. Here he used span element for reply button and when someone clicks over this button, it takes to a custom comment-reply form hidden just below the same comment that person is willing to reply. <?php else : // User is logged-in or that registration not needed to comment. // 'respond' is the ID of the comment form's wrapper. For more details and better understanding, you can look at neilpatel.com's blog comment system. I know you understood what I meant(you will have better understanding of what I am saying). Display avatar with comment form? How to make comment reply available only for login members of a certain user roles only?